All units are factory packaged with operating controls, relief valves, burner and fuel train. Installation is made simple in that only service connections are needed to place in operation. 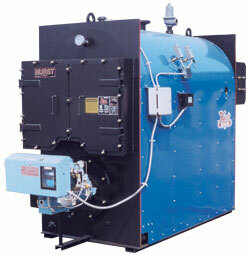 Flexible burner systems are available for firing natural gas, LP gas, No.2 oil, heavy oil, or combinations. High density 2″ mineral wool insulation assures lower radiant heat loss. In addition to meeting the requirements of UL, burner systems are optionally available to meet the requirements of FM, IRI, MILITARY and others. Steam pressure gauge with syphon and testcock; combination low water cut-off and pump control (or feeder); auxiliary low water cut-off with manual reset; water column gauge glass set with tricocks and drain valve; ASME safety relief valve(s); operating and high limit pressure control. 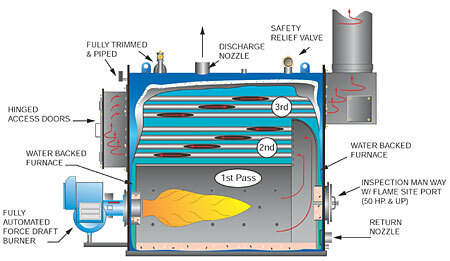 Combination pressure and temperature gauge; low water cut-off control with manual reset; ASME relief valve(s); operating and high limit temperature controls. Due to territory restrictions we can only sell new Hurst boilers inside our Indiana, Illinois, and Kentucky territory. If you are located elsewhere, you will need to contact the representative in your area for pricing.